Poltergiest was reviewed after viewing the 3D theatrical release; therefore mentioning aspects of the 3D technology. 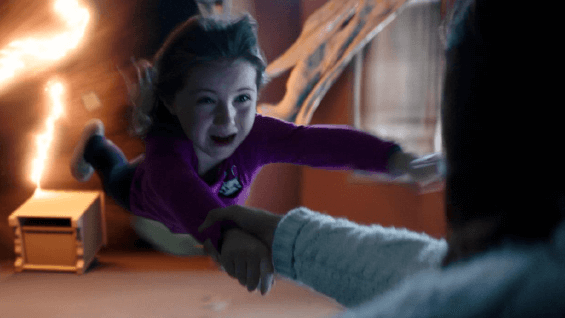 It may seem an odd thing to say about a horror film, but there was something endearing about the original Poltergeist movie – something warm and homely. This cosiness was the perfect ambience to create if you wanted an audience to engage with a family in peril and feel frightened when they are under threat. It was always Spielberg’s gift to make us actually care about his characters, and in the original movie, we did care. The Freelings were just darn likeable, and the supporting characters that entered their intimate family circle to aid them in their trouble seemed hand-picked to be memorable (has there ever been a screen medium as striking as Zelda Rubinstein’s Tangina?). Spielberg lured us into this snug environment using gentle humour played against the banalities of suburban family life. Initially, when odd things started to happen around the house, the Freeling family were excited about their playful supernatural entities. This was the calm before the storm – literally – when the sun set and the clouds rolled in and the storm hit, things started going very sour. When darkness fell and the wind rose, Spielberg engaged us by invoking the childhood fears that we all identify with – dark closets, scary dolls, malevolent tree monsters, slimy, pulsating tunnels, things waiting under the bed – before exploiting the parental fears we experience as grown-ups. That 1982 original Poltergeist movie saw an inspired pairing of mainstream screenwriter and producer Steven Spielberg with The Texas Chainsaw Massacre’s low-budget horror director Tobe Hooper. Their opposing strengths played off each other and made for an effects-laden horror movie that claimed its place as a touchstone among supernatural thrillers. This 2015 remake is merely the shrunken, exhumed corpse of 1982’s original monster. Director Gil Kenan (Monster House, City of Ember) and writer David Lindsay-Abaire have re-imagined the lush California suburb of Cuesta Verde as a shabby, nondescript development fenced in by pylons on the outskirts of an Illinois town where mother Amy Bowen (Rosemarie De Witt) attended university. Dad Eric Bowen (Sam Rockwell) has been laid off from his job, is close to bankruptcy and despite a brave front, is displaying the beginnings of a tendency to hit the bottle. They have the familiar sulky teenager Kendra (Saxon Sharbino), the nervous son, Griffin (Kyle Catlett) and innocent six-year-old Maddy (Kennedi Clements). 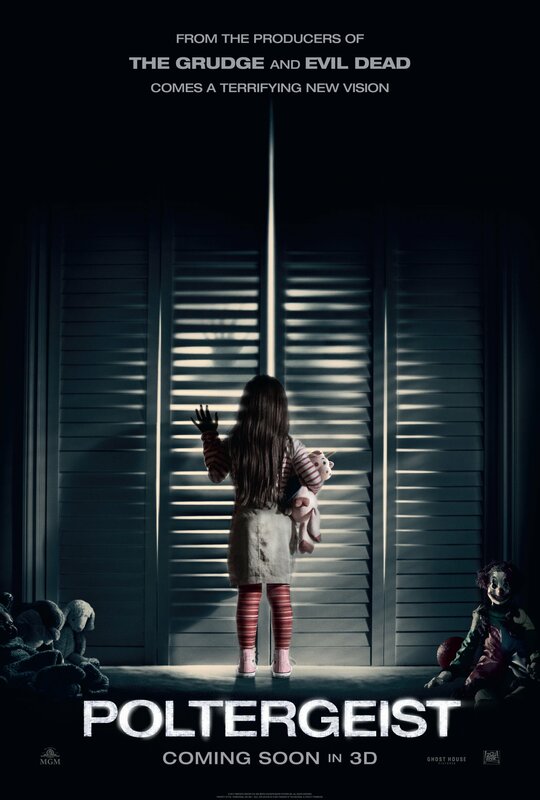 The new movie version of Poltergeist quickly dispenses with any suspense building or character development and launches into vigorous poltergeist malevolence some 20 minutes into the proceedings. While parents Amy and Eric are attending a dinner party, they are told by their hosts that the house they have just moved into is built on an old burial ground. Meanwhile their teenage daughter is being attacked by skeletal hands emerging from the oozing basement floor, son Griffin is terrorized by a clown doll before being abducted by a tree, and little Maddy is sucked into the nether-world of her closet and only able to communicate via the white-noise of the TV screen. The brisk pacing of the new version fails to build the anxious anticipation so necessary to create an effective horror movie. With an hour still left to run and little left in the way of tension to offer, Poltergeist introduces Jared Harris as a TV psychic sporting a porkpie hat who is brought in by the local university’s department of paranormal activity to help to fetch Maddy back from the spirit realm. The abrupt transition from a missing child to the TV psychic seems like rather a jolt (Spielberg made it seem so natural … supernatural, in fact). Director Gil Kenan provides some decent shocks. Production values are solid but workman-like, and the 3D doesn’t distract from the overall proceedings. Kenan’s improvements to the movie’s visual style may be attributable to advances in technology and the 3D update. While Hooper favoured mounting tension, shock value and jump scares, Kenan and cinematographer Javier Aguirresarobe construct more fluid sequences which flow well but fail to give us any lull in which to build dread. The integration of naturalistic visual effects with the digital filmmaking is almost seamless, until the plot shifts into the supernatural realm during the final attempts to retrieve Maddy. However, I can almost guarantee, if you ask viewers about the characters in this remake in a week or so, they’ll be hard pressed to remember much about them. Sam Rockwell is effective and does his best with a rather underwritten role (because, well, he’s Sam Rockwell) and Kyle Catlett makes a good attempt mainly because, as the young son of the family, he has an expanded role in this new movie. Given how little they have to work with, DeWitt, Harris, and the charming Jane Adams do what they can to inject some credibility into the sketchiest of characterizations. But, this version never escapes the shadow of its predecessor and also suffers in comparison to recent movies like The Conjuring and Insidious which, like so many others, plundered the original Poltergeist classic for ideas. The TVs in 2015 may be bigger than they were in 1982, but the scares in the new Poltergeist aren’t nearly as big as the ones supplied by Hooper and Spielberg the first time around. The haunted house story is far more tied to a literary history than most horror. It stretches back far before the dawn of cinema to the Victorian Ghost story and the eighteenth-century gothic novel. The haunted house movie was only an occasional occurrence until the 1970s with few notable items such as Robert Wise’s 1963 adaptation of Shirley Jackson’s masterpiece The Haunting. Despite many imitators and this remake, the original 1982 Poltergeist movie remains unchallenged as one of the most memorable and affecting cinematic incarnations of supernatural forces invading the security of the family home. Poltergeist (2015), directed by Gil Kenan. Based on the 1982 film Poltergeist by Steven Spielberg, Michael Grais and Mark Victor. Starring Sam Rockwell, Rosemarie DeWitt and Kennedi Clements. 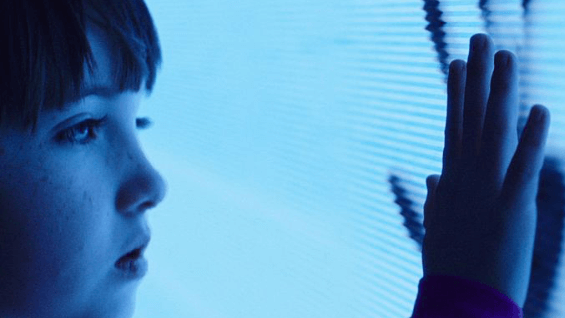 Poltergeist is a reboot of the Poltergeist franchise. Poltergeist is available to buy from Amazon in both the UK and the USA ; plus if you decide to make a purchase after following any of the links provided you will have supported Attack From Planet B, so thank you.